It’s been a while since I’ve last posted, so I thought an update is in order. Of my two projects, the STL hard science one (tentatively titled Starsiders, but will probably change that title) and the FTL space fantasy one (Paraspacers, or Freehauler Alcione), I’m going to focus on the latter one for now, as I’ve written more for that universe. Even though the literally the same material and characters could be used with both universes. So in committing my characters to the FTL universe, I’ll have to come up with different characters for the STL universe. I’ve been working on the Alcioneverse for some five years now, each new revision adding a further layer of complexity (as well as false starts and wrewrites). It can be disheartening since I sometimes wonder if I’ll ever finish anything. However I’m certainly not alone in this; there are other scifi enthusiasts who have been working on their own epic projects for 9 years, 16 years, 26 years… An epic project cannot be rushed. I’m hoping to finally get the first book, Madverts, epublished this year. Being an autistic pantser, I simply am unable to come up with a complete (or even incomplete) storyline in my head the way plotters can. I can create universes, and characters, but plots elude me. For the most part, I don’t have a pre-planned story to tell, even though I have characters and a universe to put them in. Well, two universes actually. So my current plan is an episodic approach, like a soap opera, in installments. My inspiration here is Hugh Howey who bypassed traditional channels by publishing his post-apocalyptic story on Amazon com in 60 or 100 page episodic installments. Madverts introduces the two fifteen old protagonists, Kam and Marcinay. It sets the scene for by Mechacross, which follows the same characters one or two years later, and which actually does have a complete story plot, amazing enough. Then comes another plotless pantser installment, and then a story with something of a plot (Up the Well), and finally all my characters find themselves on board the Alcione. I’ve just revised the design of the Alcione, shown above. I’ve gotten rid of the spiny mace thing, which really didn’t do anything, and the weapons module behind the cargo section, which made her too nerdish-military, and extended the cargo section. The cargo modules are build around a central backbone; it may even be possible one day to model the interior of the ship, although that would be a huge amount of work, and beyond my still rudimentary blender abilities. If each square in the above graphic represents 50 meters, that gives a total length, excluding the forward struts, of 1600 meters, or one mile. This is about the length of a soft-scfi Star Wars Imperial Star Destroyer. But the long modular shape means the average width or diameter is only 60 to 80 meters (say equal to a large modern aircraft carrier like the Nimitz), and the crew spend most of their time in a 70 by 100 meter module. Most of the ship is dedicated to propulsion, cargo, and things like hanger space, biospherics, the machine shop, etc. In terms of popular space opera, crew space isn’t that much bigger than in Joss Wheddon’s Firefly Class, but for ten times as many crew (although cargo space is another matter). I would suppose an overall weight of half a million tons, because of the tower like design. Real spaceships of course wouldn’t be anywhere as big as this. Arthur C Clarke’s 140 meter long Discovery One, by which I mean here the non-cinematic design with fuel tanks and thermal radiators is quite probably the most realistic interplanetary vessel ever envisaged in science fiction. I’m certainly not a fan of the grotesque skeletal movie version, either aesthetically or for any practical reasons. 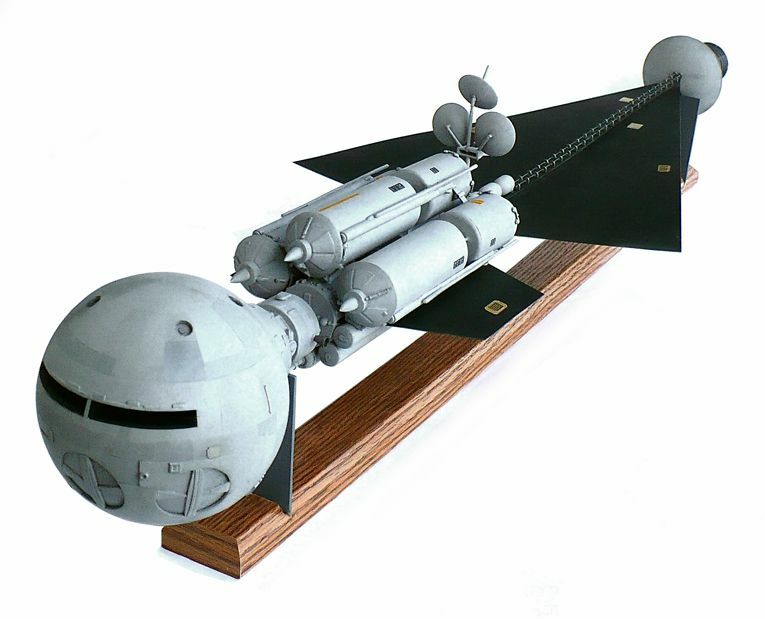 See also the excellent Atomic Rockets website for more on realistic interplanetary spacecraft. If I wanted to go full-on munchkin I could always double the size; making each square in the above diagnostic 100 meters rather than 50. That would give a length of over three kilometers and an average width of around 130 to 150 meters, which would make it closer to the Nostromo in size (except much longer), and weight would now be about 4 million tons. I don’t know if there is any reason for such giant ships, apart from nerd appeal, but settings like Star Wars, Halo, Banks Culture, Reynolds Revelation Space, and Warhammer 40k do feature enormous, multi-kilometer-long ships, powered purely by handwavium. A simple rule of thumb: the larger the ship, the less realistic the universe. In any case, the real center of my story is the human (and other sophont species) one, how a bunch of characters relate to each other and to the vast and dangerous universe they explore. No matter how amazing the tech, it is always in the background. That’s why I try to minimise info-dumps, and show the protagonists concerns to be no different to those of people today. I greatly enjoyed reading Becky Chambers’s book The Long Way to a Small, Angry Planet for this reason, even if the science is pretty cartoonish. The Alcione therefore will only come alive through the adventures of her crew, even though the ship, like all ships, has her own personality. For good science fiction it’s necessary to balance epic adventure, amazing technology, and the sense of wonder at a vast and beautiful yet uncaring cosmos, with the microcosm and warmth of the adventurers at the heart of the story.